With Memorial Day around the corner, I wanted to fill up your arsenal with low-so good BBQ dishes. And while you can always stick with traditional mains and sides, your special food needs are always a good excuse to get a little more creative. To mix things up. And serve low-so, gluten-free fish patties instead. This recipe and photo comes from my new book (which you can PREORDER NOW!). Which I hope gives you all the tips and tools (including recipes), to cook with flexibility and confidence. And while you can use the recipes just as they are written, I hope you have defying my orders. I hope you have fun mixing and matching recipes together — like, taking spices from the bacon recipe and using it on roasted cauliflower steaks. Or even adding sprinkles to the sandwich bread and turning it into a cake-like fairy treat. So let’s practice with this salmon recipe. And take it from a weekday meal to a BBQ showstopper. The directions are pretty basic — cook fish, mix fish with spices, cook fish patties, eat fish patties — but it gives you a ton of room to add personal flare. For example, let’s talk about that Dukka spice. It is a blend of toasted nuts, seeds, and spices that you can use as a rub; sprinkled on salads, soups, and even a bowl of yogurt; or folded into burgers, meatballs, and fish patties in place of higher sodium breadcrumbs. But here’s the best part, while this recipe uses pine nuts, sesame, coriander and cumin seeds, you can most definitely breakaway from what is written. Use pistachios, walnuts, and almonds. Throw in poppy seeds, mustard seeds, and caraway seeds. And let your pantry guide you to new Dukka discoveries. If you love the smoky taste of BBQ, you can also smoke the salmon first instead of baking it. And while recipe calls for the patties to cook in a hot skillet, give it an extra BBQ kick by placing them on foil and onto the grill for a final few minutes of cooking. Or better yet, cook the patties in a skillet the night before, keep covered in the fridge overnight, and then reheat on the grill (per the previous sentence) the day of your gathering. To gobble them up without higher sodium buns, wrap these patties in butter lettuce, place them atop cauliflower rice salad, or stuffed in homemade challah buns. Top them with a chimichurri, avocado, or lemon tahini drizzle. Or hot sauce! And enjoy. Preheat oven to 375dgF. Line a baking pan with parchment paper. Place the salmon fillets skin-side down on the prepared baking pan. Bake until the fish turns light pink, 10 to 12 minutes. Transfer to a plate. Once cool enough to handle, peel off and discard the salmon skin. Put a fresh piece of parchment on the baking pan. Using two forks, flake the cooked salmon into small pieces and transfer to a large mixing bowl. Add the dukka, green onions, white onions, cilantro, lemon zest, egg, and chickpea flour. Stir to combine. 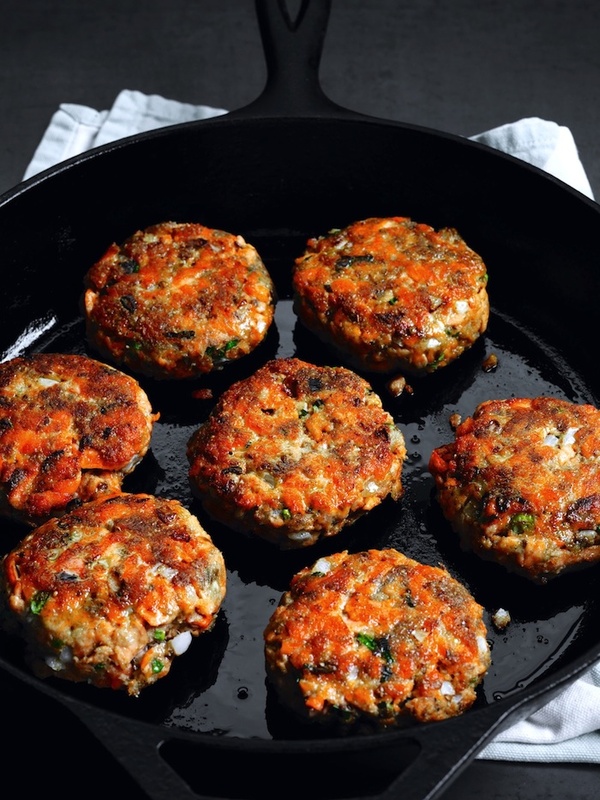 Make small salmon patties, 2 1/2 inches wide, using about 1/2 cup of the mixture per patty. Place the patties in the prepared baking pan. Cover with aluminum foil or plastic wrap and refrigerate for 30 minutes, or overnight, to help the patties firm up for successful frying. When ready to cook, line a large plate with paper towels. In a large skillet, heat 2 to 3 Tbsp vegetable oil over medium-high heat until the oil begins to ripple. Carefully put two patties into the skillet and cook until golden brown, 3 to 4 minutes. Flip the patties and cook for another 2 to 3 minutes. Transfer the patties to the prepared plate. Discard any browned bits from the skillet and repeat with the remaining patties, adding more oil and adjusting the heat as needed. 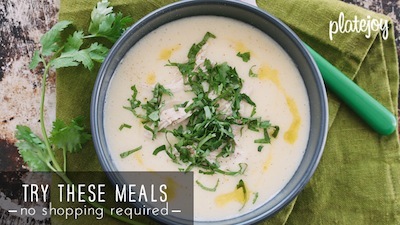 Serve warm with a squeeze of lemon juice and a drizzle of dressing. Heat a medium skillet or pan over medium-high heat. Add the pepitas and toast, stirring frequently, until they turn golden in color and begin to pop, 3 to 5 minutes. Transfer the pepitas to a small mixing bowl. Add the sesame seeds, coriander seeds, and cumin seeds to the skillet and toast until they become fragrant, about 2 minutes. Transfer toasted nuts and seeds to a food processor (or spice grinder). Add the garlic powder and pepper and pulse until the mixture forms a crumbly powder. Store in an airtight container for up to 1 month. Send low sodium recipes to my email. Just found out that I have to have open heart surgery due to damage done from my radiation treatments I had to have for cancer 26 years ago. Sodium is now not my friend! 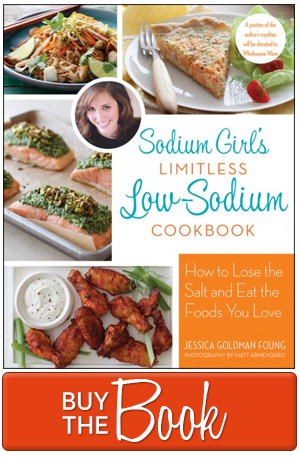 I am looking forward to learning new ways to ditch the sodium but not the flavor?